Potential applications of Biotin-CF® dye include detection of biotin binding sites and the degree of biotinylation of proteins, and for the measurement of avidin and streptavidin in crude biological samples. In addition, biotin-CF® dye can be used as a polar tracer by microinjection to study the morphology of cells. CF® dyes are very photostable which make them suitable for studies where prolonged exposure to light may be necessary. 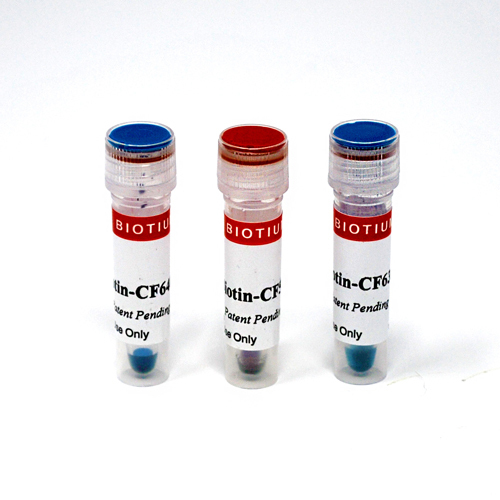 CF® Dye Biotin is available with the following CF® dyes: CF®568, CF®633, and CF®640R. Streptavidin conjugates are prepared from high quality streptavidin biotin binding protein and Biotium's signature bright and photostable fluorescent CF® dyes, and a selection of other labels.